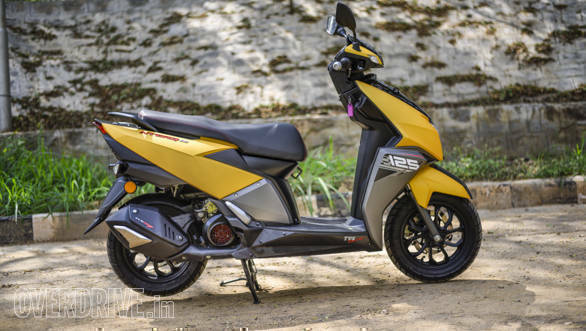 The TVS Ntorq 125 is the new entrant into the rapidly crowding 125cc scooter class. 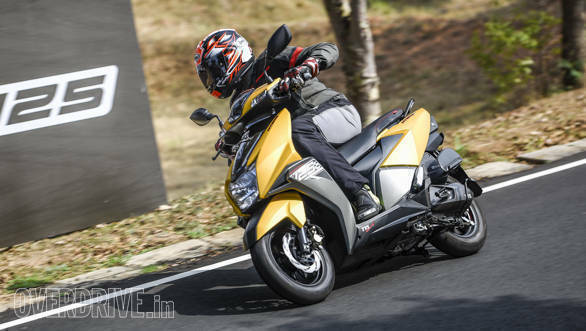 The Suzuki Access 125 dominates the segment and the Honda challenge has been extant but weak and the new Grazia intends to change that. 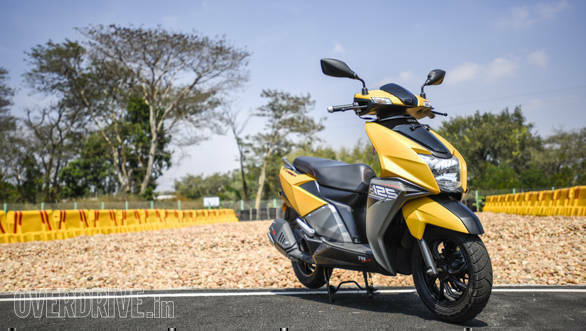 The TVS Ntorq 125 is positioned as a premium sporty scooter in design and feel with prices situated Rs 6,000 above the Jupiter and Rs 2,500 above the Suzuki Access 125, approximately. Let's look a little bit closer before we dive into the five things you'll love and three things you might not on the new TVS Ntorq 125 scooter. So this is a 124.79cc single-cylinder three-valve engine that connects to a new automatic transmission - all the gearing has been changed from the 110cc scooters. 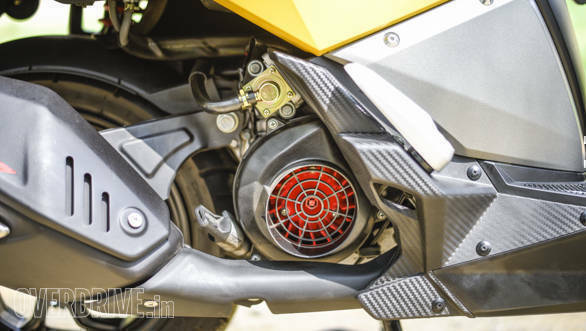 The engine produces 9.4PS at 7,500rpm and its 10.5Nm peak torque (5,500rpm) is nearly a 2Nm jump on the 110cc engine in the Jupiter - substantial. This engine is housed in a brand-new rectangular section underbone frame. 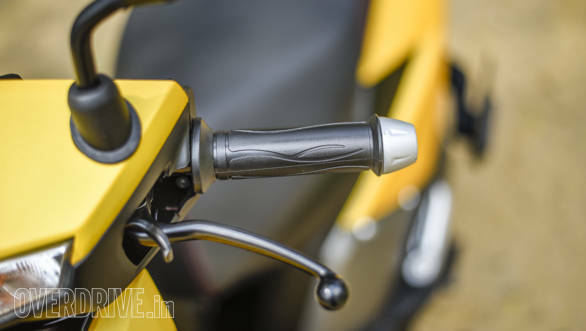 Steering geometry is the same as the Scooty Zest but the NTorq 125 gets freshly tuned telescopic forks and a gas-charged rear monoshock with a 220mm front disc. Up top is a new LCD dashboard that connects to a TVS app (on Android so far) and offers navigation assistance apart from other call and SMS information. There are many aspects of the scooter that we have already discussed in the first ride story and in the specification comparisons. But here is a list of things I believe you will love or dislike on the new TVS Ntorq 125 scooter. The TVS Ntorq looks fresh. The front is sleek and the design team has wielded a series of sharp creases that work rather well to my eyes. The interplay of matte and shiny surfaces appeals to me albeit yellow is not my colour. The level of finish is evident in the panel gaps, the little details including faux carbon-fibre textures here and there that really make the scooter stand out. And just check out those alloy wheels! I do wish it was sportier but here is a smooth and fast scooter. 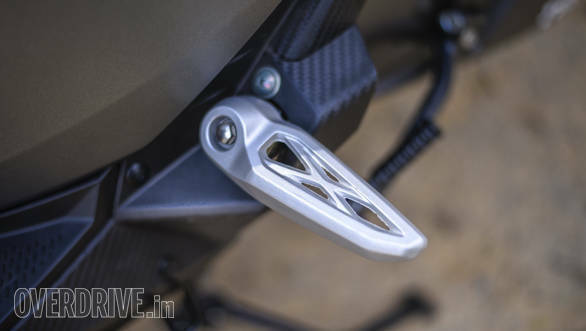 I was hoping for the eagerness of the Scooty Zest multiplied by the extra cubes of the engine but TVS has made an engine that takes one noticeable step forward but without making the scooter feel too sharp or edgy. 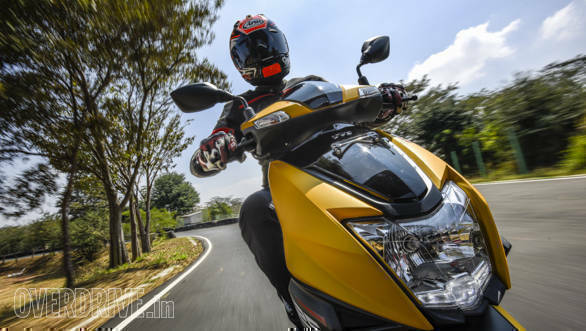 For most riders, this will be enough of a change for them to perceive the NTorq is a sportier scooter than the average 125 or 110cc offering. And if you're pimply and millennial, your parents will be able to borrow this periodically and make the milk run work too. I cannot begin to explain how good scooters, even mild-mannered commuting ones, can feel in corners once you get past their essentially small-wheeled, slightly top-heavy feel. 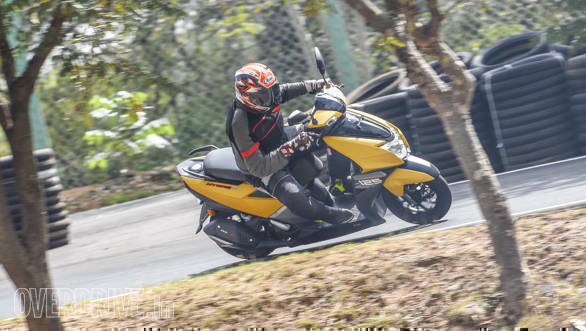 The TVS Scooty Zest remains the best of the lot in my book and the NTorq is extremely happy at lean angles too. 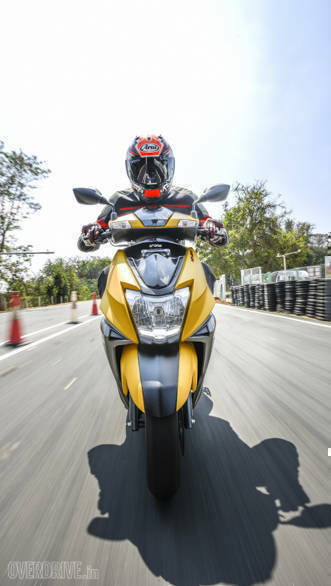 The new 110-section TVS tyres are grippy and given just a moment or two, you'll be scraping plastics and giggling to yourself inside the helmet. Almost by accident, I found that you can wedge your knee against the bulge in the apron tht accommodates the steering mechanism and headstock while the narrowing of the footboard in the middle offers just enough purchase for a big boot to find purchase too. So you can now hang off like you would on a bike confidently and go just a little bit faster around the corners too. Score! I think we need to mix a go-kart track and the Ntorq as soon as possible. I loved these! 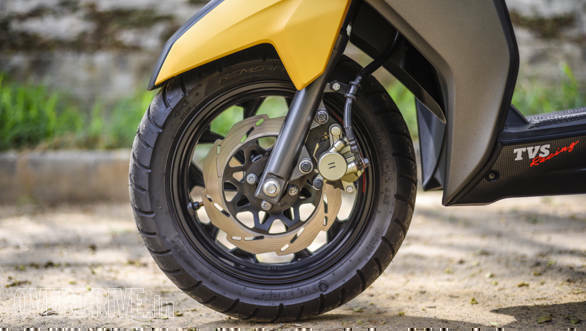 Between the setup of the suspension and the tuning of the initial bite and overall brake force, the TVS Ntorq has some of the best brakes I have tested on a scooter. There is some dive and all that, but locking a wheel is extremely hard to do and yet, slowing the scooter down is very, very effective. ABS would be an improvement but I think you'll find that on a normal, dry day, triggering ABS would be extremely hard to do. Feel is a subjective thing. 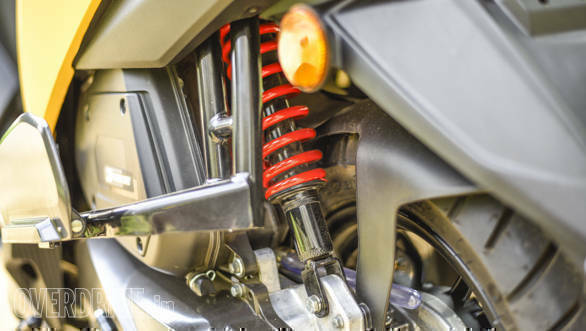 It's a combination of refinement, design appeal, throttle response, cornering character and many other small elements. But done right, it can produce a machine where the sum of carefully chosen 10 components becomes a magical 110. The TVS Ntorq feels like it heads in that direction. My only hesitation comes from the fact that our test ride was not on city streets. Here is a scooter that should feel really energetic and responsive on the street while firmly feeling like a normal scooter is expected to. For context, the Aprilia SR 150 feels like that but under no circumstances could you classify the Aprilia as a normal commuting scooter as India understands it. But there is an argument to be made for the Ntorq not being sporty enough. I would have been even happier if TVS had pulled out all the stops and gone full-hard and full-sharp for the scooter. I believe the time for a no-compromise sporty scooter has come and the Ntorq isn't it. Savvy product the Ntorq is, for sure, but TVS does its usually shrewd product engineering and design while skewing firmly towards the conservative side. I would have liked more equipment. From the front, I'd have liked an LED headlamp from the word go. 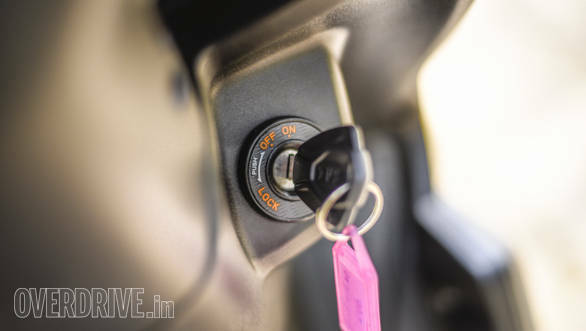 I'd have also appreciated the one-slot key mechanism that integrates seat/gas tank cap release into the front apron. But on the flip side, the rear brake lock lever is perfect. It makes all the others, especially the chrome 'cap' style ones look tacky and under-designed. Ditto the feel of the two buttons you use to interact with the dash. If I were buying the TVS Ntorq, my over-developed sense of detail would kick in. I'd replace the enormous pillion footpeg with something more matched to the idea of a sleek and sporty scooter. In silver it attracts attention and I'm not convinced it looks good enough to warrant the attention. Similarly, TVS uses two chrome-tipped Allen bolts on the grey panel that sits at your heel. They're the two fasteners you can see on the side profile. Why so shouty? Almost all other visible fasteners are colour matched. Oh and I'd prefer brighter coloured wheels for sure. 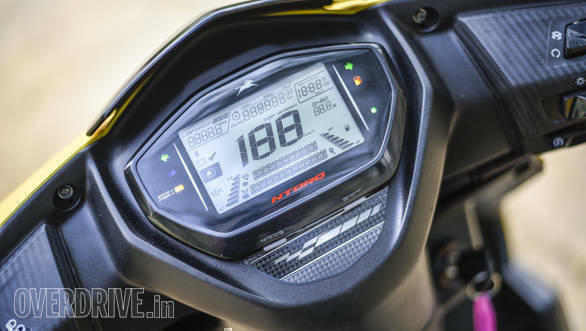 There's a lot of love on the new TVS Ntorq 125. It goes well, turns rather well, stops brilliantly and it looks like that. Cannot wait for our test bikes to come so that we put this promising new TVS scooter (and platform) through the paces. Be sure to read our comprehensive first ride story and if you have questions, just #AskOD.